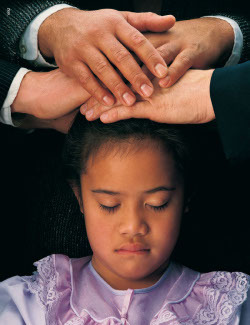 Confirmation is an ordinance in which a person is confirmed a member of The Church of Jesus Christ of Latter-day Saints and given the gift of the Holy Ghost by the laying on of hands. The ordinance is performed after baptism. Permission from a bishop or Mission president is required for a Melchizedek priesthood holder to perform a confirmation. Another priesthood holder may assist. The priesthood holder lays his hands upon the head of the newly baptized person and through the power of the priesthood and in the name of Jesus Christ confers upon him/ her the Holy Ghost. The Holy Ghost becomes the person's constant companion, as long as the person remains worthy of this gift. After the gift of the Holy Ghost is conferred, the priesthood holder may then pronounce a blessing upon the person. This blessing is often revelatory. It relays a personal message of encouragement from the Lord and is specific to the individual receiving it. This page was last edited on 23 January 2012, at 14:16.